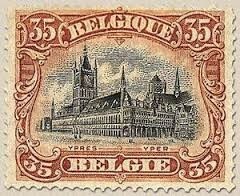 The Belgian postal service managed to make one issue of Red Cross Fund stamps on 2nd October 1914 in Antwerp before the government was forced into exile on the 13th of the same month. There were several issues during the war period. 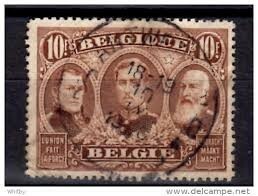 In January 1915 there was a new Red Cross issue with a portrait of King Albert I. 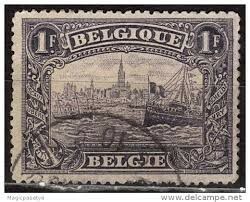 In 1915 a series of railway parcel stamps was printed but never issued. 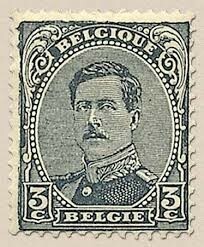 In the same year a new design of the king's head was produced and printed for a range of definitives on a variety of papers ranging from greyish to thin white. 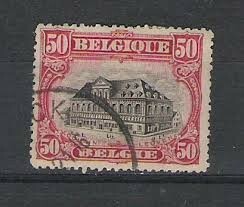 Higher value stamps show patriotic images and events: the cloth hall at Ypres, Dinant, Louvain, the freeing of the Scheldt, the annexation of the Congo, King Albert at Furnes and the Kings of Belgium. 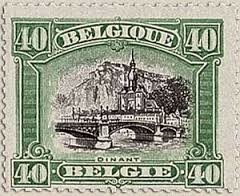 Further Red Cross stamps were issued in January 1918. 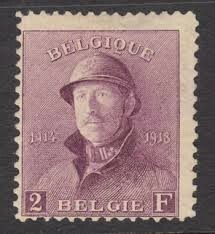 In 1919, after the restoration of government to Brussels, King Albert was depicted with a soldier's helmet. 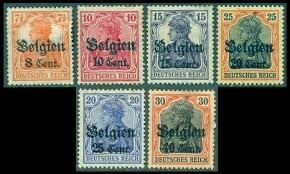 During German occupation virtually all of Belgium used German stamps overprinted with Belgian currency.